[p.5] The Colorado Region NEEDS YOU! [p.6] Sports Car Magazine Historical Issues Digitized! [p.7] Oct-Duro Registration Opens soon! [p.8] Rocky Mountain Sidewinders Recruiting Efforts Showing Results. Please use the ballot posted in REDLINE or on the Colorado Region Website at www.coloradoscca.org and mail your vote if you are not able to attend. For those that don’t know me my name is Kevin Carter, I am the Divisional Administrator of Emergency Services for the Rocky Mountain Division as well as the Emergency Services (ES) chief for Colorado Region, I’ve been a member of SCCA as well as the Colorado Region for 9 years now. In those 9 years I’ve acted as ES region chief, division equipment manager, as well as the DA for ES. I believe I can be a very productive member of the region board. Over the last few years Colorado region has moved forward in a positive way in all the aspects of the club and I believe I can help in moving the region even farther forward both in increasing worker and racer participation. I hope everyone will have faith in me in being a part of the Colorado Region board. I have been a member of SCCA since 1985 working F&C until 2003 when I contacted West Nile Virus and was no longer able to do that. I have represented the Colorado Region for the Colorado Motorsports Council since 1998 and am current President. I have been actively working with the City of Pueblo for the past 3 years to update and reopen Pueblo Motorsports Park. Repaving of the whole track will happen in mid October this year. I have only spent three years on the current Colorado Region Board of Directors and feel that another three years will help anchor its progression. I will continue our mission to keep the Colorado race tracks open and running. 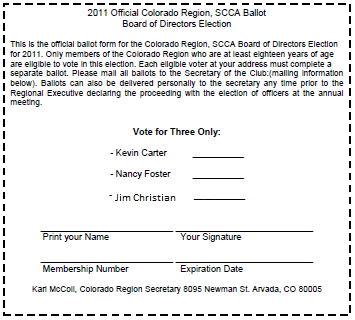 I would appreciate your voting me back into the Colorado Board of Directors for another term.